When? Thursday 18th September Who? 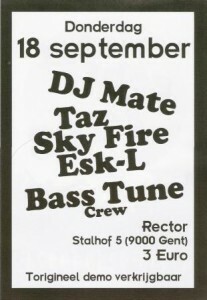 MATE, TAZ, ESK-L, SKY FIRE and BASS TUNE CREW Where? De Fuifzaal formerly known as ‘de Rector’ (Overpoort-Ghent).